Wandering Archive brings together work by four artists. Across installation, painting and photography, the works presented here engage with the concept of the archive in personal, and often playful, ways. Eschewing austerity and authority, these artists have produced idiosyncratic archives, or interactions with institutional archives, that emphasise the archive as a process, defined by transience, malleability and re-interpretation. IMAGES | Clare Rae, Untitled (glass plates), Archival pigment print, 60 x 80cm, Ed. of 5 + 2AP, 2013| Karla Marchesi, Mittwoch, Oil on board, 50 x 60cm, 2013 | Melanie Jayne Taylor, Coastal Fragments, Archival pigment print, 70 x 58cm, Ed. of 3 + 1 AP, 2013 | Jessica Hood, The Cave & the Archive: Elery Hamilton-Smith’s stereograph collection, One-hundred and sixty-two 35mm colour transparencies, two Kodak Carousel projectors, ceramic coated glass, projector stands, 2015 |Images courtesy of the artist. Archives help us remember. They give us things we can hold in our hands. As time passes, they tell us what was considered important, what was worth holding onto, and then, in time, we choose what is worth revisiting. Archives tell stories through the process of collecting. Karla Marchesi’s suite of seven paintings, presented here, creates a personal archive, and builds upon an art practice that has often explored the way in which we imbue the objects around us with significance, via meticulous renderings of the detritus of hoarders, backyard assemblages, and hard rubbish collection, for example. 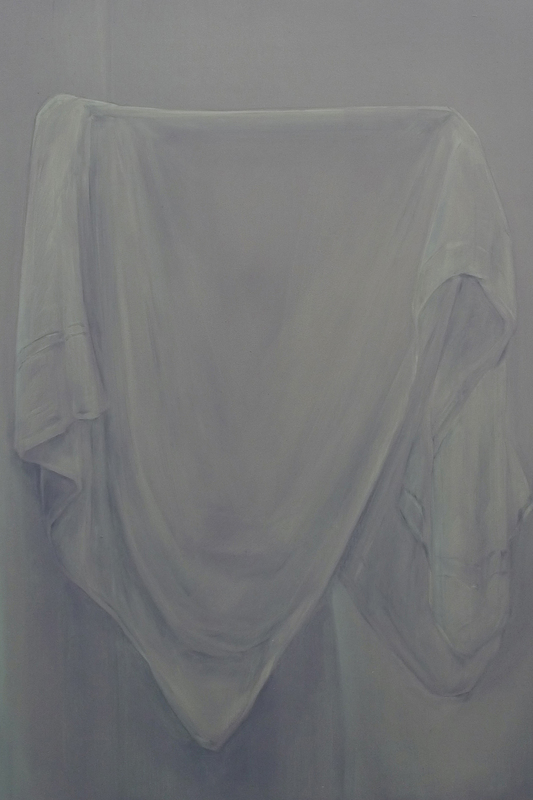 The paintings in this series depict the artist’s bath towel as it hangs from a hook in her bathroom each day for a week, uniquely interpreting the towel’s successive range of textures and folds. Marchesi captures, through layers of paint, the fleeting moments that construct our lives, but which we rarely stop to notice. Here, Marchesi spends more time preserving the moment for her catalogue, than the towel spent hanging in that formation on the rack. But this seems to be the nature of cataloguing and remembering. The layers of paint are applied like a memory that is revisited and remade. Marchesi titles her works according to the day the scene occurred, creating a systemised order to the chaos of everyday life, and allowing these fleeting moments to be both recorded and compared. Produced in the early months of Marchesi’s relocation from Australia to Germany, the works capture both the beauty of the everyday, and the way in which objects take on new significance amongst processes of dislocation. This series of paintings, a makeshift archive of a small detail in a new context, emphasises a single moment’s continuity with, and subtle differences from, every other day and every other place. Clare Rae’s Untitled (NGV) series of photographs presents a very different view of the archive. Photographed in the National Gallery of Victoria’s photographic storeroom, Rae is seen awkwardly negotiating the space. She appears most at ease in the space when she takes an almost animalistic form, crawling through the space, partially obscured behind shelving, hanging from racks. Rae’s body appears as an intrusion into the order of the archive. This is the paradoxical condition of the archive. We have archives in order to view them, to look back and remember them, but each interaction threatens their existence. Rae’s photographs capture a moment of a fleeting impromptu gesture, juxtaposed against a context designed to maximise order and consistency. Rae’s body is an interruptive presence within a precisely controlled and monitored space that attempts to ensure the images it contains remain fixed, unchanging, and predictable. constant reinterpretation and reconfiguration. This process brings to light previously dormant narrative and graphic connections between images and even between exhibitions. Taylor’s images are constantly unboxed: this is an archival practice defined by interruption rather than stasis. Jessica Hood’s recent work, The Cave & the Archive: Elery Hamilton-Smith’s Stereographic Collection has emerged out of research undertaken at the State Library of Victoria. Accessing the collection of stereographic slides, Hood has reappropriated this pre-cinematic technology, at a time when we are in a similar moment of paradigm-shifting technological change, and one where stereoscopic imagery is again gaining traction as both an optical toy and scientific instrument. Hood’s use of antiquated technology, presenting the work via slide projectors, seems defiant given the ease with which digital technology is able to reproduce the world mimetically. This turn away from the transparency of digital mediums to revel in the specificity of the analogue process, tends to shift focus away from the content in favour of its form. Included in the formal process is the catalogue itself. The work literally shifts the focus from the ‘objects’ in the archive to the archive itself, its rooms, drawers, folders, files, and other methods of organisation, as the work slowly turns. Accessing physical objects from archives is a disappearing process as archives are being systematically digitised. It is the tactile experience of the physical archive that Hood seems to reinstate with The Cave & the Archive, as we marvel at the strangeness of the stereograph, held in the artist’s hand and reconfigured through the use of another antiquated technology, the slide projector, leaving us to wonder about the future of the physical archive and the potential for alternative engagements with the material. The work of each artist included in Wandering Archive engages with the concept of the archive in personal, and often playful, ways. Eschewing austerity and authority, these artists have produced idiosyncratic archives, or interactions with institutional archives, that emphasis the archive as a process, defined by transience, malleability and reinterpretation.